This lovely house was totally renewed in a very fresh provençal style. 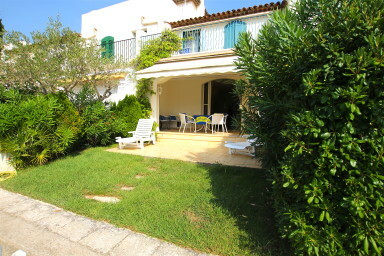 It is located in a private area of Port-Grimaud that is very quiet. On 2 levels it is composed on the ground floor of a wide living-room with a furnished open kitchen and a bathroom with guest toilets, and on the 1st floor, 2 bedrooms -including a large one- with two bathrooms. One bedroom has a large sunny terrace. This house has got the air-conditioning and a floor-heating that can be turned on from a distance. On the canal side there is a West-oriented loggia that can be closed by the electrical rolling shutter and a sunny garden. There is a 14m x 5.77m (on the quay) mooring and a numbered parking space in front of the house, something very rare in Port-Grimaud.